The Odyssey Black Label Series FZGSMIXDECKGTBL is an ATA flight case designed specifically for the Numark MIXDECK DJ controller featuring Odyssey�s revolutionary patented Glide Style� laptop/gear platform. 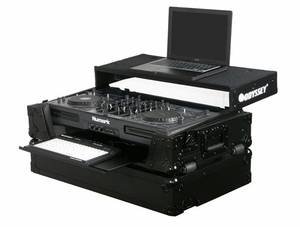 Diverse and functional, the FZGSMIXDECKGTBL�s patented Glide Style� design gives performers seamless access to their laptop or music gear with a sturdy wide-base glide platform at the top and a convenient pullout keyboard glide tray surface at the bottom(Keyboard sold separate). The protective case also features an exclusive, patent pending, high-density bevel foam that neatly angles upward from the interior of the case to effectively raising and displaying the MIXDECK controller for an efficient control surface. The stylish V-Cut� removable front panel allows for easy access to the MIXDECK's front controls, headphone/mic jacks, and disc slots. A spacious ventilation pit under the MIXDECK is ideal for storing cables and other accessories. Odyssey also offers MIXDECK protective cases without the Glide Style� design in both the Black Label Series� (FZMIXDECKBL) and standard Flight Zone� with chrome plated hardware (FZMIXDECK), as well as a standard chrome on black Glides Style version (FZGSMIXDECKGT).